Having survived the blitz of new stuff on Billboard (it goes with review the music territory) let me say. other than one or two bright spots, I have fled to a safer refuge – independent music and unsigned artists. 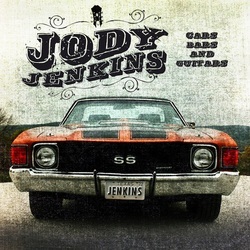 I have never heard of Jody Jenkins, much less listened to his music. It has been my loss. However, I am catching lost time fast, as his latest Bars, Cars & Guitars enjoys neighbour annoyance with my repeated plays. Jenkins, a Texas native, a guy who has done the rounds, played the bars and hauled his guitar here, there and back again, is an exciting find. A 15-year music veteran, Jenkins comes armed and ready to play. With his aptly named album, the eleven tracks come infused with a Tex Mex feel, primed with plenty of steel and accordion. With the triple talents of songwriter, singer, and co-producer, Jenkins has pulled together a solid showcase of toe-tappers and well-crafted tunes. The father of two sons stands as a welcomed addition to the distinctive sound that is Texas. The track serving as an album signpost is the now-at-radio “Beer Drinkin’ People.” Fast paced with a good time guarantee, the track is a guitar-driven piano-led accordion-fired standout pick. However, it must have been a hard choice in the Jenkins’ camp, as this album comes stoked with several great cuts that would make any radio programmer’s job easy. With this third album, San Antonio’s popular son has built on a solid mix of keenly penned tunes, a voice made for country, and a band that can play traditional and new with polished ability. Standouts: “Baffin Bay”, “Boy’s Night Out”, “Cars, Bars & Guitars”. It’s out now on Zone 7 records.